Atlantic City has been given the nickname, “America’s Favorite Playground.” The glitz and glimmer from the high-rise casinos at this Atlantic Ocean-side city with plenty of gaming opportunities and great entertainment along with the beaches remain its major draw. However, the tranquil surroundings within an easy drive in southern New Jersey provides golfers with plenty of artfully-crafted and well-maintained courses to spend time on during the daylight, ranging from links style to parkland style to classic gems to some more modern styles. The Scotland and Ireland influence is obvious when you look back at the history of golf in this area and nowhere is this more evident than at the Atlantic City Country Club. Scottish professional John Reid routed the first nine holes back in 1897 much like it was done back in Scotland, letting nature lead the way. Willie Park Jr., William Flynn and Howard Toomey added their touches. More recently, the course was renovated in 1999 by Tom Doak. The classic design, sitting on the edge of water with views of Atlantic City, has hosted six United States Golf Association championships, including the 1901 U.S. Amateur won by Walter Travis, the 1911 U.S. Open won by host professional Johnny McDermott at age 19 and the 1948 U.S. Women’s Open won by Babe Dickinson Zacharias. In addition, the golf terms birdie—commemorated by a rock on the 12th hole telling of the approach shot Abner Smith hit to within inches—and eagle originated here. While I did not get a chance to play the course myself since the ING just had lunch and demo day at the facility, I asked fellow scribe Tony Leodora from Philadelphia about his view. He indicated it was the best public course in the area. “It’s one of my favorite places to play in the country,” Leodora added. I know he gets around to play a lot of top courses in the country as the host of The Traveling Golfer and so that’s good enough for me. If you do opt to play here, do expect to pay a little more to play as green fees range from $100 to $225, almost twice as much as some of the others. When an impatient Clarence Geist, an oil and gas baron from the early 1900s, found Atlantic City Country Club a little crowded, he decided to build his own course, the Bay, at the Seaview Hotel and Golf Club. Scotsman Hugh Wilson, who designed Merion Golf Club in the Philadelphia area, handled the design work and it opened in 1914. A year later Donald Ross completed the course, adding bunkers and some strategic elements. Bob Cupp renovated it in 1998, returning it more to what Ross intended originally, including the crowned greens. 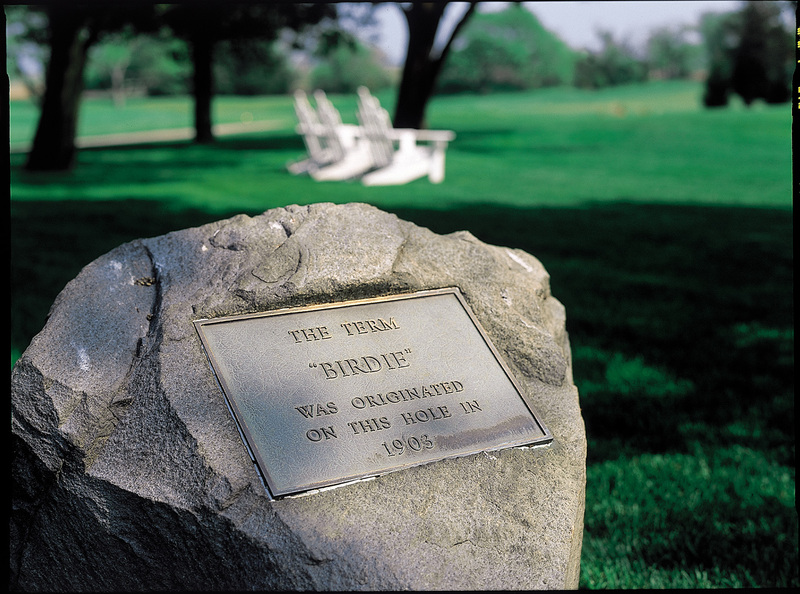 In 1930, the firm of Flynn and Toomey, added nine holes on a second course, the Pines. William Gordon, a former associate of that firm, added another nine holes in 1957. While the Bay, which hosts the ShopRite LPGA Classic, is a links style layout and wide-open on the water’s edge with breathtaking views of the Atlantic City skyline, participants in the Durland Cup during the ING Spring Conference found the Pines puts more of a demand on precision because most of the fairways are lined by trees. Another course with links across the pond is the Links at Brigantine Beach, designed by Wayne Stiles and John Van Kleek and opened in 1927. It offers breathtaking views of the bay, native marshes, rolling terrain with no trees and Scottish type berms and mounds. HarryVardon and Walter Hagen used to practice here before boarding the ship for The Open. Breezes definitely add to the challenge here. At McCullough’s Emerald Golf Links, Stephen Kay, designed 17 holes in tribute to Scottish courses like St. Andrews, Carnoustie, Prestwick, Turnberry and Royal Troon. In addition, Kay designed No. 7 in tribute to Alister McKenzie, who won an award for the design but never had chance to actually build it. Water comes into play on five holes and the course features the only 100-foot elevation change in the area. Although it doesn’t meet the definition of a links course put forward by some writers since it is not located on the water, Archie Struthers moved a lot of dirt to create a links taste at Twisted Dune. Devoid of trees with sand dunes framing each fairway, it has been called by some the most visually striking golf course in southern New Jersey. Fiendish bunkers and large waste areas add to the challenge. *Ballamor Golf Course, another one of Leodora’s favorites carved out of dense woods. *Blue Heron Pines Golf Club, featuring the natural beauty of the Jersey pinelands with tree-lined fairways adding to the challenge. *Harbor Pines, another one of Kay’s designs built in a pine forest where golfers feel like they are playing in a natural amphitheater. *Mays Landing Golf & Country Club, designed by past PGA of America president and Atlantic City C.C. golf professional Leo Fraser, featuring tree-lined fairways. *Running Deer Golf Club, providing golfers with feeling of serenity as most of the holes are separated. *Sand Barrens Golf Club, called the closest thing to a desert course you will find on the East Coast with 27 holes on a sandy piece of property. *Scotland Run Golf club, built in and around an old sand quarry, offering a blend of wooded and links style holes with the quarry holes. *Sea Oaks Golf Club, a player friendly parkland course with wide fairway and undulating greens. *Shore Gate Golf Club, called a “thinking man’s course,” featuring a unique combo of parkland and links holes with natural elevation changes. *Vineyard Golf at Renault, a Edward Shearon design, celebrating its 10th anniversary in 2014 and featuring multiple risk-reward options with views of the nearby vineyards. *Wildwood Golf & Country Club, an old fashion design that celebrates 100 years in 2016.